I'm still scratching my head in disbelief! Tiger Woods just doesn't blow two shots leads during the final round of a major. Yet the facts don't lie and while Y.E Yang celebrates a momentous win for both himself and South Korea, the American world number one is left to contemplate quite how it all happened. If the cap fits...Well Tiger's certainly didn't at Hazeltine as he suffered a shock final round collapse. A total of 14 times Tiger had gone into the lead of the final round of a major and 14 times he'd emerged victorious. So what went wrong on this occasion? Was it over- confidence or was he just upstaged by a more determined and cooler opponent on the day? I've given this a lot of thought and in conclusion I genuinely believe it was anything but over- confidence. Quite the opposite in fact. There's no doubt in my view he's the undisputed best player in the world but has he lost that aura of intimidation out there on the course when it really matters? Look at the way he won the U.S. Open in San Diego last year. That was a terrific achievement given what we now know about his knee injury. But it was his sheer presence and WOW factor that proved too much in the end for Rocco Mediate. For me, he never quite looked as though he believed he could win. And of course, Tiger took full advantage. But at Hazeltine, a little over a year on, how things had changed! Woods more than met his match and then some! Yang proved a much sterner challenge and quite frankly Woods wasn't up to it. There was one player out there looking under pressure and more than a little jittery on those clutch closing holes and it sure wasn't the South Korean. I think we can safely say for the first time in his illustrious career, Tiger was buckling under the sheer intense heat of the moment. To say he “choked” is perhaps not appropriate in my view and detracts in some way from yang’s efforts but I do know it’s a term that would be applied to other players in similar circumstances by some sections of the media. Just not Tiger. Yang’s winning philosophy turned out to be quite simple as he would later reveal. He just relaxed, enjoyed himself and let his playing partner take all the strain...it certainly worked a treat didn’t it? After all, nobody expected him to win. 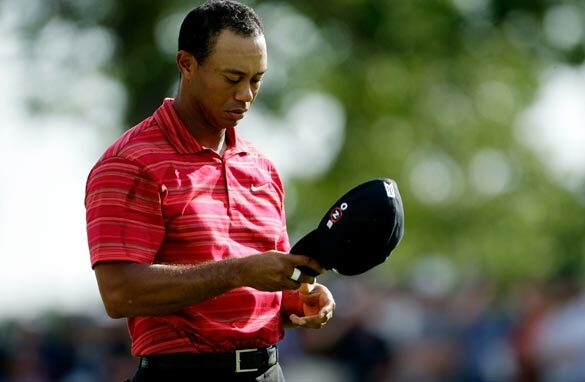 His ploy worked well and I for one will be fascinated to see how Woods reacts to this huge setback. It’s the first time since 2005 he’s gone a whole season without winning a major and for all his talk ahead of this event that’s it still been a good comeback season for him, don’t be fooled. It hasn’t . Tiger’s all about winning grand slam events. He even says as much. And after not seriously challenging at the Masters, the British Open and the U.S. Open, this latest near miss is utterly devastating for his morale. And to make matters worse, he’s now got many long months ahead to reflect on what by his standards was one spectacular capitulation. You can be sure Woods will bounce back of course but just how this will effect him remains to be seen. 2009 saw his great friend Roger Federer rise to be the very top of his sport but Tiger is left lagging behind the legendary jack Nicklaus - whose record haul of 18 majors looks just a little safer for now. It proves that when it comes to winning golf’s biggest prizes, Woods still has plenty of work ahead of him before he too can call truly himself the best ever. I have sons who i told to model themselves after tiger.He was my role model.I will hold complete judement until he explains.I am very disappointed.I told my boys tiger is only human.